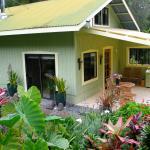 W00981660-01 Situated in Paauilo Mele Manu is a country house featuring a barbecue. Guests benefit from free WiFi and private parking available on site. A fridge and a stovetop can be found in the kitchenette. Towels and bed linen are provided in this self-catering accommodation. The nearest airport is Hilo Airport 53 km from Mele Manu.